It is an input field which takes hidden value from the user. 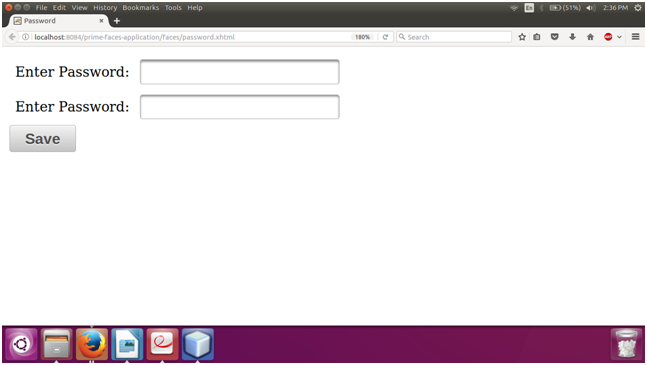 The <p:password> component is used to create a password field in JSF application. 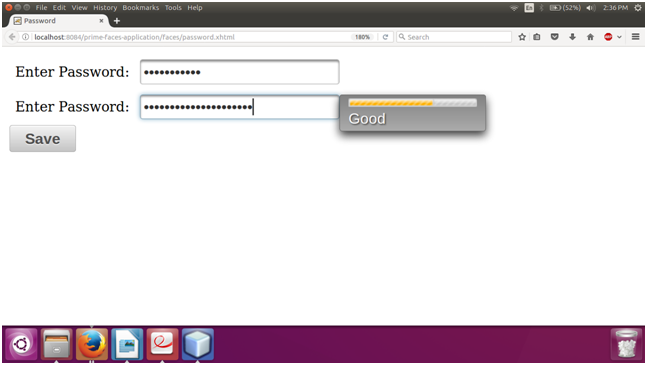 It also provides feedback while entering the password. It has various attributes that are tabled below. feedback false Boolean It enables strength indicator. inline false Boolean It displays feedback inline rather than using a popup. promptLabel Please enter a password String It is a label of prompt. weakLabel Weak Boolean It is used to set label of weak password. goodLabel good String It is used to set label of good password. strongLabel strong String It is used to set label of strong password. redisplay false Boolean It is used to display previous value. match null String It matches id of another password component to match value against. size null Integer Number of characters used to determine the width of the input element. style null String It is used to set inline CSS of the input element. tabindex null Integer It is used to set position of the input element in the tabbing order. Here, in the following example, we are implementing <p:password> component. This example contains the following files.